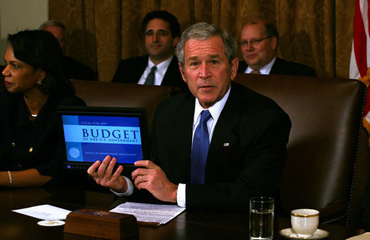 President George W. Bush holds up a computer with the administration's 2009 "e-budget" — the first U.S. budget to be submitted electronically — for the cameras during a Cabinet meeting Monday, Feb. 4, 2008. Close on the heels of the United States’ completed fiscal year 2008 budget — which was finally passed by Congress only a month ago after four continuing resolutions — President Bush unveiled his proposed budget for fiscal year 2009 on Monday. But the new $3.1 trillion budget is likely to cause more heated debate with the Democrat-controlled Congress. Government spokesmen touted the 2009 budget, which increases military spending and cuts funding to Medicare and Medicaid, as putting the United States on a track to economic surplus by 2012 — but Democrats in the Senate blasted this on Tuesday, noting that the proposed budget does not include projected spending for the wars in Afghanistan and Iraq past 2009. The prospects for science reflect the administration’s focus on security and the military, with few increases in non-security research spending. A few programs received a boost, such as NASA’s earth science program, with new Earth-observing missions designed to help researchers track climate change. And one highlight in the National Science Foundation's proposed budget is funding for four new cutting-edge research facilities in astronomy and physics. Below are snapshots of some of the science budgets. With the budget essentially flat for non-security spending and the administration’s stated focus on fiscal restraint, increases for science and technology in the proposed 2009 budget are modest. That budget, however, "is more than adequate to meet the needs of the nation," OSTP Director John Marburger told a crowd of reporters on Monday. Spending for research and development would be increased by $4.3 billion, for a total of $147 billion, a 3 percent increase over last year’s request. However, citing a funding imbalance between biomedical research and physical science research, Marburger said, “the continued erosion of the physical science budget is a serious problem.” To help address the issue, the proposed budget allocates $12.2 billion to the American Competitiveness Initiative, which includes funds for the National Science Foundation, the National Institute of Standards and Technology and the Department of Energy’s Office of Science. The money will go to support basic research, fund a research and development tax credit and improve math and science education in the public schools. Whether the program will be fully funded is uncertain, however. In December, Congress awarded the initiative $10.6 billion for 2008, $800 million less than President Bush proposed in his 2008 budget. The budget also emphasizes the Advanced Energy Initiative, a program designed to further research on technologies such as clean coal, nuclear power, hydrogen fuel cells, fusion energy, cellulosic ethanol and solar and wind power. The proposed budget would ramp up funding for the initiative from $2.5 billion in 2008 to $3.2 billion in 2009, a 25 percent increase. The president’s budget also proposes a small boost for the troubled Climate Change Science Program (CCSP). According to the American Association for the Advancement of Science, the CCSP’s budget in real terms fell about 23 percent between 2003 and 2008. Last year, the president asked for just $1.6 billion, down about $200 million from his 2007 request. The proposed 2009 budget calls for a 10 percent increase, putting funding at just over $2 billion, 90 percent of which would go to NASA, NOAA, the National Science Foundation and the Department of Energy. Restoring some of the deep cuts that DOE sustained in the enacted 2008 budget, the 2009 budget requests $25 billion for the department, an increase of more than $1 billion over last year. Much of the money will go to new technologies for carbon capture and storage, developing clean coal technologies, security and maintenance of nuclear materials and facilities and additional money for basic research, including for the American Competitiveness Initiative ($4.7 billion) and the Advanced Energy Initiative ($3.2 billion). Overall, the Office of Science would receive $4.7 billion, a sizable increase of nearly 20 percent over the enacted 2008 budget. A large chunk of that would go to High Energy Physics and Fusion Energy Sciences, which would receive $805 million and $493 million, respectively, and to Basic Energy Science, which would receive $1.6 billion. The budget also includes money for the new Energy Frontier Research Centers initiative. The budget indicates a push to improve nuclear power in the United States, with $1.4 billion aimed at nuclear research. Following the tight squeeze on funding that NSF received in the final 2008 budget — the foundation received only a 2.5 percent increase in total funding this year, compared to an anticipated increase of 10 percent — the president has requested a 13.6 percent increase for NSF to $6.85 billion for 2009. About $800 million of that increase reflects a growing understanding of the need to invest more in basic science research, according to NSF Director Arden Bement Jr. That money includes funding for cross-foundational programs to invest in new computational capabilities and to research Earth's freshwater resources (jointly with USGS). "While humans can survive without petroleum, they cannot survive without water,” Bement told reporters Monday. The $5.59 billion requested for primary research is a 16 percent increase over the enacted 2008 budget and is in line with the American Competitiveness Initiative, which would double the budgets of NSF, the National Institute of Standards and Technology and the DOE Office of Science over the next 10 years. Highlights of the budget include $148 million for four new cutting-edge research facilities in astronomy and physics, and $115 million for a diverse portfolio of smaller-sized instruments and other tools. Additionally, nearly $1 billion would keep a range of U.S. facilities — including polar research vessels, astronomical telescopes, geological and environmental monitoring networks and NSF’s South Pole Station — up and running. Ocean research, a big winner in 2007, would still receive $17 million for the Ocean Research Priorities Plan, and the budget includes a modest increase for the Integrated Ocean Drilling Program and the Academic Research Fleet. However, NSF took its proposed $331 million Ocean Observatories Initiative off the table at the last minute, although it may rejoin NSF’s queue of projects after a review later this year. The agency also gave graduate research fellowships a boost, with a 30 percent increase in the budget. Undergraduate research didn’t fare so well — although it was promised a large increase, it only received a 6 percent increase, and early career development programs would get an 8 percent increase. 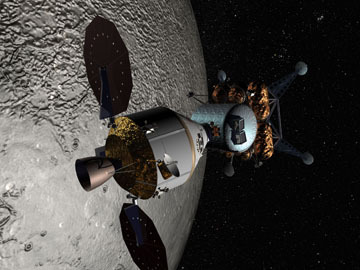 An artist's rendering of the Orion Crew Exploration Vehicle, part of NASA's Constellation Program to return humans to the moon, shows the vehicle docking to a lunar lander in orbit around the moon. NASA’s overall budget request for fiscal year 2009 only increased by 1.8 percent over the enacted budget for fiscal year 2008, but the agency’s Science Mission Directorate got a big boost, including seven new initiatives and increased funding for the earth sciences. “We are all really excited” about this year’s budget request, said Alan Stern, associate administrator of NASA's Science Mission Directorate, at a press conference on Monday. The science mission, which is responsible for all projects within the realms of earth sciences, planetary sciences, astrophysics and heliophysics, saw a budget request of about $4.4 billion, with $1.4 billion for the earth sciences alone. The budget requests decreased for the heliophysics and astrophysics programs this year, and stayed essentially flat for many of NASA’s programs in space exploration and travel. The good news about this year’s earth science budget is the commitment to fund two new decadal survey missions: the SMAP mission for soil moisture mapping and a second-generation ICESat mission to measure changes in ice mass around the globe, said Shana Dale, NASA deputy administrator, at a press conference. The earth science program will also fund three additional decadal survey missions, she said. Budget support for space exploration and travel would include: another Hubble repair mission; work on the Mars Science Laboratory and further Mars missions such as Mars Scout and the Mars Sample Return mission; work on the Lunar Reconnaissance Orbiter and other moon observations; and preliminary work on sending orbiters to Venus, Europa, Titan and beyond. NASA will continue to fund the International Space Station, while simultaneously funding competitive bids for commercial development of crew and cargo carriers to the space station. Furthermore, as NASA ramps down its space shuttle program (set to close in 2010), it proposes funding the shuttle’s replacements, the Orion Crew Exploration Vehicle and the Ares I Crew Launch Vehicle (which will launch Orion) at $1 billion apiece. EPA’s budget continues to be slashed, with the proposed $7.14 billion budget for 2009 being 4.4 percent less than its 2008 budget. Much of the money would go to beefing up the agency’s energy and homeland security efforts, in addition to new initiatives to limit greenhouse gases and mitigate climate change. The Clean Air and Global Climate Change program, one of EPA's top goals, would receive $939 million, about $33 million less than the 2008 appropriations. The agency's Climate Protection programs were cut by about 9.5 percent relative to the 2008 budget. The budget sets aside $49.2 million for Clean Diesel grants, which are aimed at promoting energy efficiency and reducing emissions from diesel engines. That's an increase of almost $15 million from last year’s request, but only 25 percent of the authorized amount. Almost all of the increase would go to shoring up the energy efficiency of cargo ports and infrastructure. Additionally, the EPA request includes $14 million for environmental reviews related to new energy projects, and funds several sustainable infrastructure initiatives targeted at Energy Star energy-saving technologies. The budget also includes $98 million for climate change programs to reduce greenhouse gas emissions, with another $5 million going specifically to the Asia Pacific Partnership to support international efforts to reduce greenhouse gas emissions, and $4.4 million to promote methane recovery and use at landfills, coal mines and natural gas facilities. The plan also proposes $1.3 billion for Superfund cleanup, an increase of $10 million, as well as increased funding for Brownfields site cleanup. After gaining a $1 billion budget in 2008, the U.S. Geological Survey may have less money to work with in 2009, as President Bush’s proposed budget calls for USGS to receive only $968.5 million. Among the increases: USGS would receive an additional $8.2 million over the 2008 enacted budget to conduct the first national water census in 30 years as part of the Department of the Interior’s (DOI) Water for America Initiative. This includes an additional $5 million to the National Streamflow Information Program to update hundreds of streamgages. USGS would also receive $16.1 million for its share in the DOI Oceans and Coastal Frontiers Initiative, a $7 million increase over the 2008 enacted budget and more than triple the amount received in 2007. Most of that money would go to the Coastal and Marine Geology Program, including $4 million to study the Extended Continental Shelf to determine the country’s Arctic boundaries — of increasing urgency as countries mark their territories in the quest for oil and gas buried beneath the Arctic ice. The 2009 budget also provides USGS with an additional $3.5 million for the agency’s part in the DOI’s Healthy Lands Initiative. Ecosystems Science would receive $10.4 million, including a $6.2 million increase to fund Biological Research and Monitoring projects in areas such as the Everglades, Chesapeake Bay and the Mojave Desert. New to the USGS budget in 2009 is the National Land Imaging Program, which would receive $2 million to ensure continuous collection of land imaging data in the future. USGS would also restructure its climate change research funding, grouping it under a single umbrella that would receive $31.4 million. That funding would include $21.6 million for the new Global Change Activity and an additional $4.8 million from the Climate Change Science Program. The 2009 budget would also retain $5 million of the $7.4 million that Congress added to the USGS budget for climate change research in the 2008 budget. Other USGS programs did not fare as well. The National Water-Quality Assessment program would lose $10.9 million, which would halt data collection on groundwater and drinking water in 29 states, according to USGS. And the Water Resource Research Institutes Program, which provides funding to state water research programs, would not be funded at all — although Congress may choose to save the program, as it has in previous budgets. The Earthquake Hazards Program stands to lose about $5 million, and the Minerals Resource Program was again targeted for drastic cuts. Bush’s budget includes $26.3 for the program, or about half of its 2008 enacted budget, which would result in the loss of 210 full-time employees, according to USGS.